The proposed pedestrian/bicycle bridge near the WSU-Spokane campus is said to have a unique “cable-stayed arch” design – perhaps the only one in North America or even the northern hemisphere. But that claim is based on a subtle difference between other arch bridges, a subtlety that few people will notice. Instead of a central tower for the suspension bridge, the Spokane bridge will have an arch over the center and the suspension lines drop down from that. Otherwise, it is a suspension bridge. UPDATE: A NEARLY IDENTICAL BRIDGE WAS BUILT IN 2007 IN DALLAS, TEXAS – SEE BELOW FOR DETAILS. The arch was not picked for any symbolic value other than its grandness, said Brandon Rapez-Betty, University District project manager for the Downtown Spokane Partnership. “It was meant to be a loud, iconic statement to help send a message that the University District is a major opportunity for economic development,” he said. “The preliminary renderings show a graceful, arched refinement of the cable bridge across the Columbia River at Tri-Cities; the first of its kind built in the United States.” – uh, comparing this globally unique design to an existing bridge that already exists? Here is what the bridge looks like in an illustration from the designers (source). It contains an arch and cables down to the suspension deck of the bridge, hence, a cable-stayed arch bridge. It is a suspension bridge, a common bridge design. But rather than use a tower for the support structure, an arch that runs perpendicular to the deck is used – that is the “unique” part. EXCEPT IT IS NOT UNIQUE. THE SAME DESIGN WAS BUILT IN 2007 IN DALLAS, TEXAS. 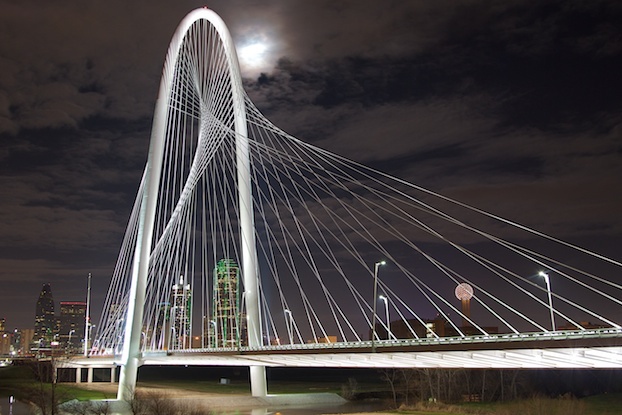 The Margaret Hunt Hill Bridge in Dallas is nearly identical to the above bridge. The claim of a unique bridge design falls on its face as another of Spokane’s many lies. The area has a serious problem with lying. A bridge proponent lists other “similar” bridges in a comment to this blog, which are suspension bridges for pedestrian/bicycles. 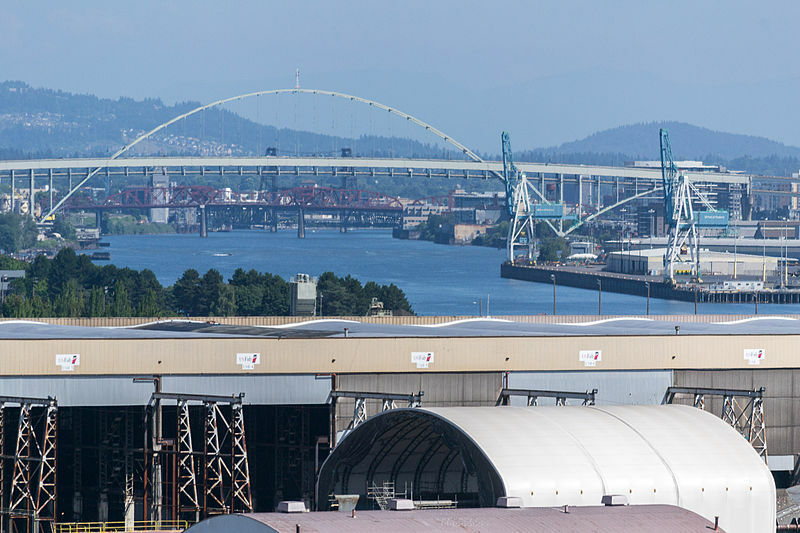 Portland is known as “bridge town” and is a good starting place to look at different types of bridges. 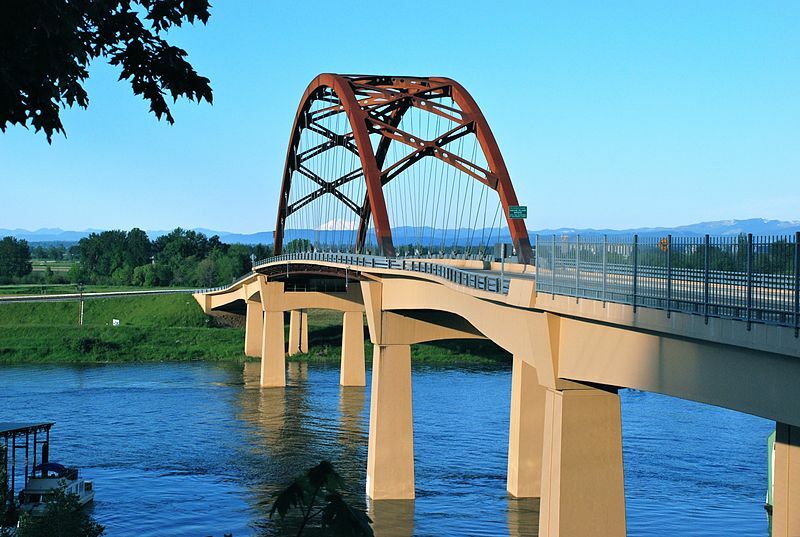 Here is a photo of the Sauvie Island Bridge located near Portland (this apparently is not in North America but in a strange land called “Portlandia”). The photo comes from Wikipedia. Note carefully – it has an arch structure and cable-stays suspending the bridge deck. Here, the arch runs in line with the bridge deck while the Spokane bridge arch would be perpendicular to the deck. This is not the only bridge of this type in Portland, either. The Fremont Bridge is a similar design (photo from Wikipedia). And then there is this bizarre bridge on the Portland’s light rail system. Note the arch traversing the roadway with cable stays suspending the light rail line bridge. Image from Wikipedia. 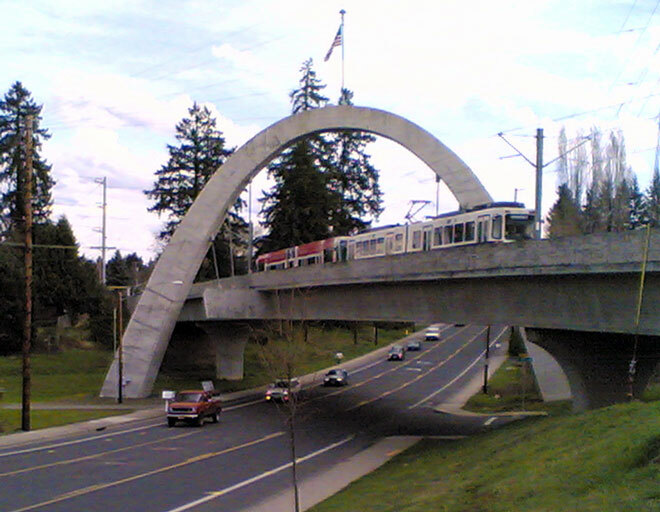 In this case, the arch is perpendicular to the light rail line, virtually the same as Spokane’s proposed “unique in the world” bridge. The difference is that the suspension lines go roughly straight down from the arch, rather than to points across the bridge. There are some technical differences in these designs that only a civil engineer is likely to care about – the general public, not so much. The uniqueness of the proposed Spokane bridge is merely that is has an arch over the center of the bridge, rather than a tower, and the arch is perpendicular to the deck, rather than parallel. 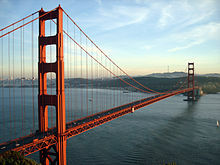 The Golden Gate Bridge, pictured here, uses a tower to support the cables. The Spokane bridge span will look like this but have a tight arch in place of the tower. You can sort of visually see the Spokane bridge by imagining a curved, narrow arch in place of this tower. Photo is from Wikipedia. That’s a pretty subtle level of “uniqueness” that the general public probably will not notice. The claim that Spokane’s bridge will be unique depends on the public recognizing the subtle differences. No one will care about the subtle technical differences. Fundamentally, it is a suspension bridge held up by an arch in the middle instead of a tower. The Monroe Street Bridge was at the time of construction, largest bridge of its type in the U.S. and 3rd longest in the world for its type. Did this design create an icon driving economic development or was it merely that having a bridge (any bridge) that provided for economic development?